Growth Habit: Erect, up to 1m. Leaves alternate, club shaped, margin uneven, toothed and wavy. The solid and pithy stem (circular in cross section) is not usually branched except for short branches towards the top. Flowers: White flowers, 4mm in diameter, each with 4 petals. The inflorescence is a terminal corymb and tends to be umbrella shaped. It may reach up to 120mm in diameter. Fruit/Seed: The fruits divide into two compartments, each containing one seed. Germinability of fresh seed is very high. Dispersal: Whiteweed has a extensive and persistent root system. Rooting depths of up to 1.8 metres have been recorded for field infestations. Regeneration of plants from root fragments following cultivation is rapid and such fragments are a principal method of spread of whiteweed within and between paddocks on farms. Seed is also a common method of transfer of whiteweed, particularly on uncleaned implements and machinery. Distribution: Whiteweed is common in the south-eastern and Midlands areas of Tasmania but occurs only occasionally in the north of the State. The plant has been present in the south-eastern cropping areas for over 100 years. Observations over the past few years indicate that it is increasing in the Midlands and Derwent Valley. Status: Whiteweed is classified a Secondary weed under the Noxious Weeds Act 1964. Landholders may be required to control whiteweed by an Enforcement Notice or to comply with prescribed measures contained in a regulation prepared under the Act. Whiteweed is a significant weed of cropping, reducing yields through competition for moisture and nutrients. Sheep will graze whiteweed at most growth stages and it is rarely seen in well-managed sheep pasture. 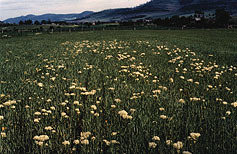 Cattle and horses usually avoid grazing whiteweed. The plant is reputed to taint the meat and milk of grazing animals. Grazing. Whiteweed is grazed by sheep and it may never be noticed in heavily grazed sheep pastures. In some such cases landowners have commenced cropping sequences in infested paddocks without being aware that whiteweed is present and found subsequently sown crops or pastures to suffer severe competition. Sheep may be introduced into pastures grazed predominantly by cattle and horses to reduce whiteweed infestations. However, grazing only serves to remove the shoots of the plant and whiteweed will persist even under very heavy grazing. As whiteweed may taint the meat of grazing stock, sheep should not be used for control of the weed immediately before being sent for slaughter. Chemical control. The optimum time for herbicide application to whiteweed is at the rosette to early-flowering stage of plant growth (mid to late spring). Prior to this time, shoot emergence may not be complete: after this time, the flowering heads may reduce leaf interception of the herbicide spray, and leaves begin to senesce (and become less receptive to herbicide). Maximum leaf area at the time of spraying is necessary to ensure that adequate herbicide is absorbed for translocation to the root system. In pastures, herbicides which are effective on whiteweed are often severely damaging to clover. Where regeneration of sub clover is important, herbicide treatment should be delayed until after the clover has set seed. In such circumstances, the late application will significantly reduce the effectiveness of the treatment. No currently available herbicide can eliminate a well established whiteweed infestation in one application. Integrated control programs. As with most weed, control programs for established whiteweed infestations may need to be implemented over two or more years to reduce the weed to manageable levels. For specific recommendations on herbicides for whiteweed control, contact the Department of Primary Industry and Fisheries for a copy of the Whiteweed Service Sheet or your local rural merchandiser.